Microsoft just unveiled Windows 8.1, the long-awaited update to its latest operating system, and showed off various new features and customization options. 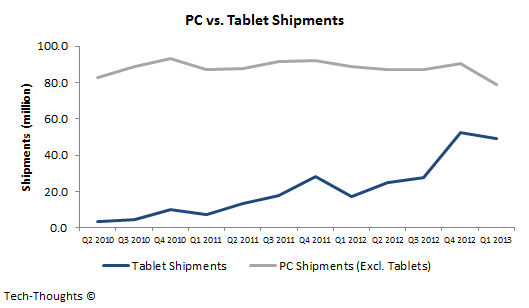 Unfortunately, these changes are unlikely to improve PC shipments or Microsoft's tablet market share. Microsoft has attempted to market Windows 8.1 as a "refined blend of the desktop and modern application experience". The two biggest changes Microsoft has been focusing on are the return of the "start button" and the ability to boot to desktop directly. The start button is more of a cosmetic change as it just seems to be a link to the "modern" start screen. Meanwhile, the option to boot directly to desktop isn't enabled by default, and therefore, is unlikely to have a major impact purchasing decisions made by mainstream consumers. Based on this, I would have to stand by my earlier prediction of PC shipments dropping to the 65-75 million range by Q4 2013. Windows 8.1 should have no impact on the attractiveness of tablets based on the platform. While it does offer some improvements, tablet purchases are based on two primary factors (for both usage segments) - application availability and price. Even smaller Windows 8 tablets are far more expensive than competing Android tablets (prices of which are dropping to the $99 range). This problem is being compounded by low OEM interest in the ARM version, Windows RT. The availability of the fully functional version of Windows 8 is unlikely to make up for high prices because of the difficulty of using legacy applications on touchscreens. While the Windows Store has seen some growth over the past three months (to nearly 100,000 apps), it is still far behind the application ecosystems available on Android & iOS. This makes is even more difficult to justify premiums for Windows 8 tablets and is unlikely to result in market share gains.